In 2013 Moody Publishersacquired the works and rights of Wing Spread Publishers. 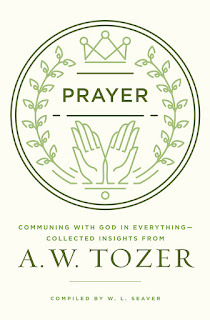 Among the 138 titles they bought the rights to were 58 works by AW Tozer, the former pastor most known for his legendary work “Pursuit of God.”Since that time Moody has been publishing several of these works under new titles and compilations.I recently bought Prayer: Communing with God in Everythinga collection of insights from the sermons, books, and lectures of Tozer. Compiled by WL Seaver, this book takes short (1-4 pages) excerpts from Tozer on prayer in each chapter.The book is all about prayer, but it is not on cohesive work in the sense a book is normally thought of.Beyond the excerpts, after each chapter there are several pages that dive deeper into what Tozer says, sometimes pushing back a little, sometimes giving nuance, but always probing you to think deeper.This 1-2 page followup is closed out by several questions meant to help you “Reflect and Apply” the teachings. Each year the Tishomingo United Methodist Church hosts Holy Week Luncheons, and it was my privilege to address them this year. William O Carver was a SBC pastor and professor of Missions at Southern Baptist Theological Seminary from 1898-1943. He developed the missions program at SBTS, the first such in the United States. After 1943 his unfinished memoirs were published, "Out of His Treasure." Carver tells of a time when as a young teenager he took it upon himself to start a program for the young people of the church in order to facilitate their spiritual growth. "Without consultation with my elders or our church leaders, I announced that on Sunday evenings I would read the scriptures and sermons to anyone who card to come together. Soon we were having a goodly number, mostly young people, sharing happily, and let us hope, with some profit in these evening meetings. Some of the young people were learning to lead in prayer and to share in reading the scriptures and, most of them, in singing.